DMF International announced the inclusion of new Traffic doors, which is an addition to the exisiting comprehensive range of DMF climate control doors. The new Traffic door caters for high levels of impact traffic. The operation of the new Traffic door is semi automatic, allowing the door to close automatically from either direction of opening. The heavy duty V-Rotor hinge can swing 180 degree, and as an option 270 degree swing, which makes it ideal for openings leading into hallways. The Traffic door is constructed of a durable high strength 3mm thick ABS surface, core filled with PU foam, which offers great insulation. 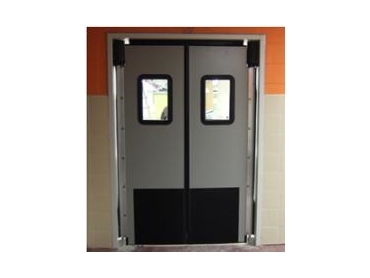 The doors can be manufactured as pairs or singles, and can accommodate openings up to 3mH x 3mW. Windows come as standard, using clear polycarbonate, and the option of kick plates, or spring bumpers are available to maximise the impact resistance. To increase the seal, rubber gaskets are located between the door and jamb, as well as in the centre. The Traffic door is ideal for supermarkets, commercial kitchens, retail stores, and processing areas, and with the option of stainless steel surfaces, is ideal for clinical production areas.